Preceded in death by her husband Gerald D. & daughter Cynthia. Survived by son Greg (Roseann); grandchildren Harmony (Joey) Richman, Ashley Venburg & Gerald R. Venburg. Funeral Service Friday 11:00 a.m. at FIRST PRESBYTERIAN CHURCH, 535 20th Avenue North, SSP. 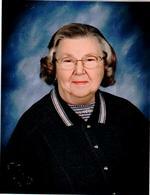 Visitation Friday 10:00 – 11:00 a.m. at the Church. Interment Ft. Snelling National Cemetery. A special thanks to the wonderful staff at Shoreview Senior Living for all their care and compassion.